LANSING — If you’re a state official who likes free food, 2017 is shaping up to be another good year. 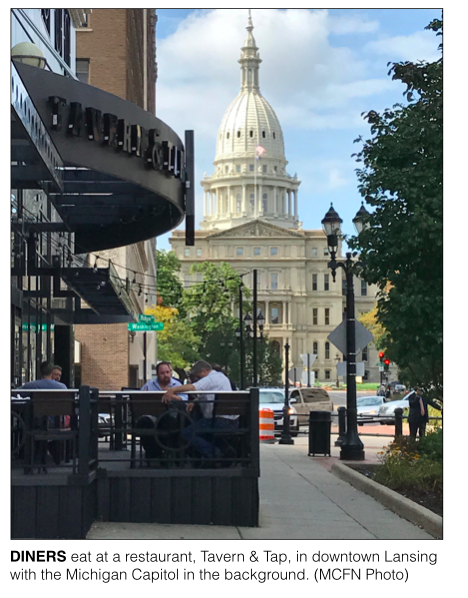 Michigan lobbyists reported spending $540,598 on food and drink purchases for public officeholders over the first seven months of 2017, according to new state disclosures. That total is the second highest ever posted for the first seven months of a year. It fell just short of the record, which came in 2015 when Michigan lobbyists reported spending $552,524 on food and drink for officeholders between Jan. 1 and July 31. For the entire year of 2015, they spent $837,867, which is the state record for a full year. Now, in 2017, lawmakers and lobbyists could be cooking up a challenge to that record, according to the early numbers. Lobbyists have averaged spending $8,862 per scheduled House session day on food and drink for officeholders so far this year. That’s according to reports lobbyists had to file on their total spending with the state on Aug. 31. Their reports covered from Jan. 1 through July 31. They’ll report on their spending for the last five months of the year by the end of January 2018. Under Michigan law, public officeholders themselves don’t have to file reports on who’s buying them meals. The job falls on lobbyists, and the lobbyists’ reports provide only a partial picture of who’s benefitting from all the food and drinks they purchase. Lobbyists have to disclose broad information about food purchases they make for state officials in group settings, like when a corporation or a multi-client lobbying firm buys meals for a group of lawmakers. But they only have to disclose an individual officeholder’s name when they spend more than $59 on food and drink in a month for that specific official or more than $375 in a year. Because of the reporting threshold, lobbyists can keep secret many of their dining partners. So while lobbyists spent $540,598 on food and drink over the first seven months of 2017, the public has information on the recipients for less than half of that total: $240,463. Of the $240,463 fully disclosed, lobbyists disclosed information for $171,463 in purchases for groups of officials and for $68,679 in purchases for individual officials. Some officials received many more free meals than others, according to the disclosures. Sixteen state lawmakers received more than $1,000 in food and drink purchased by lobbyists in the first seven months of the year. 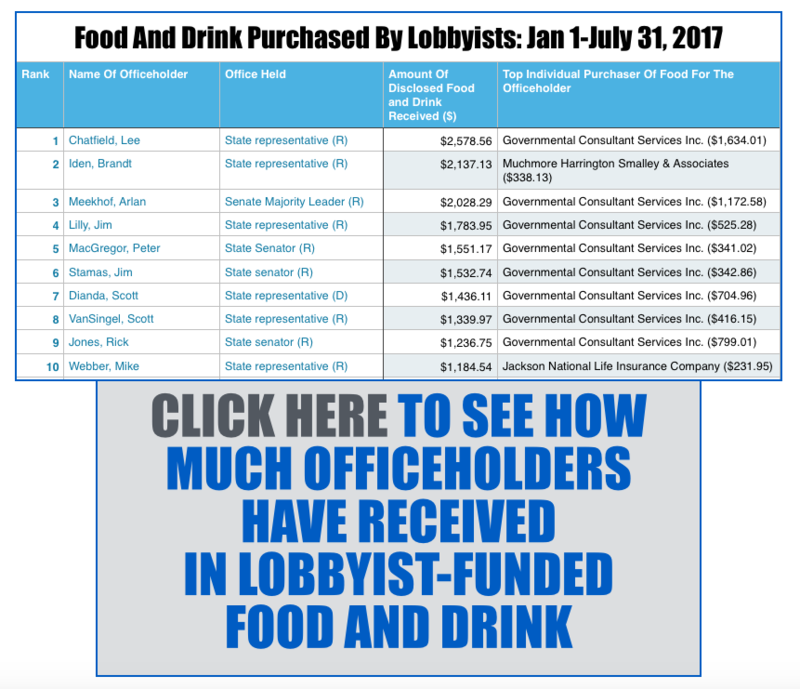 The full list of how much each officeholder received in food and drink from lobbyists is available at this link. At the top of the free-lunch list is Rep. Lee Chatfield, a Republican from Levering, who is the speaker pro tem in the state House. According to lobbyists’ disclosures, they spent $2,578 for food and drink for Chatfield between Jan. 1 and July 31. Chatfield is important player in Michigan politics currently because he is the chair of the House Republicans’ campaign efforts for 2018 and he’s also one of the candidates who hopes to be elected leader of the House Republican caucus for the 2019-2020 session. Behind Chatfield was Rep. Brandt Iden, a Republican from Oshtemo Twp., and Senate Majority Leader Arlan Meekhof, a Republican from West Olive. Iden, who chairs the important House Regulatory Reform Committee, received $2,137 in food and drink, according to lobbyists' disclsoures. Meekhof received $2,028. For comparison’s sake, the average American household spent $3,154 on food away from home in 2016, according to the federal Bureau of Labor Statistics. Lobbyists have also been working hard to get know 41 first-term House members who took office in 2017. Of the 16 lawmakers who received more than $1,000 in free meals of the first seven months of the year, five were first-term House members. Leading the freshman list were Rep. Jim Lilly, a Republican from Macatawa, who received $1,783, Rep. Scott VanSingel, a Republican from Grant, who received $1,339, and Rep. Michele Hoitenga, a Republican from Manton, who received $1,090. Lawmakers also received food and drink in group settings where interest groups, businesses and multi-client firms bought meals for large numbers of public officials. The top purchasers of meals for lawmakers in group settings were DTE Energy, which paid $25,823, multi-client lobby firm Muchmore Harrington Smalley and Associates, which paid $13,025, and Consumers Energy, which paid $12,117. At least 15 lawmakers also benefitted from travel and lodging funded by registered lobbyists over the first seven months of 2017. The total cost of the trips was $24,015, according to state disclosures. The top purchaser of travel and lodging was the Virginia-based Consumer Technology Association, which describes itself as a “a catalyst to the dynamic technology industry.” The association paid for six Michigan lawmakers to take part in its 2017 “LIT program,” in January, according to its disclosure. The association’s Leaders in Technology dinner took place on Jan. 6, 2017, in Las Vegas, according to its website. The lawmakers were the following: Chatfield; Sen. Rick Jones, a Republican from Grand Ledge; Sen. Peter MacGregor, a Republican from Rockford; Meekhof; House Minority Leader Sam Singh, a Democrat from East Lansing; and Sen. Rebekah Warren, a Democrat from Ann Arbor. The Michigan Railroads Association paid $4,339 to have Rep. Triston Cole, a Republican from Mancelona, and Rep. Jim Tedder, a Republican from Clarkston, take part in its summer board meeting in July. Cole is chairman of the House Transportation and Infrastructure Committee. Tedder is chairman of the House Tax Policy Committee. The Michigan Beer & Wine Wholesalers Association paid $3,617 to have four lawmakers be panelists at a “winter convention.” They were the following: Sen. Jim Ananich, a Democrat from Flint; Rep. Chris Greig, a Democrat from Farmington Hills; Sen. Mike Kowall, a Republican from White Lake; and Rep. Dan Lauwers, a Republican from Brockway. All four are high-ranking members within their caucuses. Ananich is the Senate minority leader. Greig is the House minority floor leader. Kowall is the Senate majority floor leader. Lauwers is the House majority floor leader. The California-based auto company Tesla Motors paid $3,292 to have three lawmakers take part in “public policy meetings with company executives.” They were Sen. Tom Casperson, a Republican from Escanaba, Cole, and Rep. Gary Glenn, a Republican from Midland. The Telecommunications Association of Michigan reported paying $958 to help Rep. Michele Hoitenga, a Republican from Manton, participate in meetings with the U.S. Department of Agriculture, the Federal Communications Commission and congressional staffers, according to the association’s disclosure. Hoitenga is chair of the House Communications and Technology Committee. Under state reporting requirements, lobbyists have to report trips they purchase for officeholders only if the trips “in connection with public business” cost more than $775. 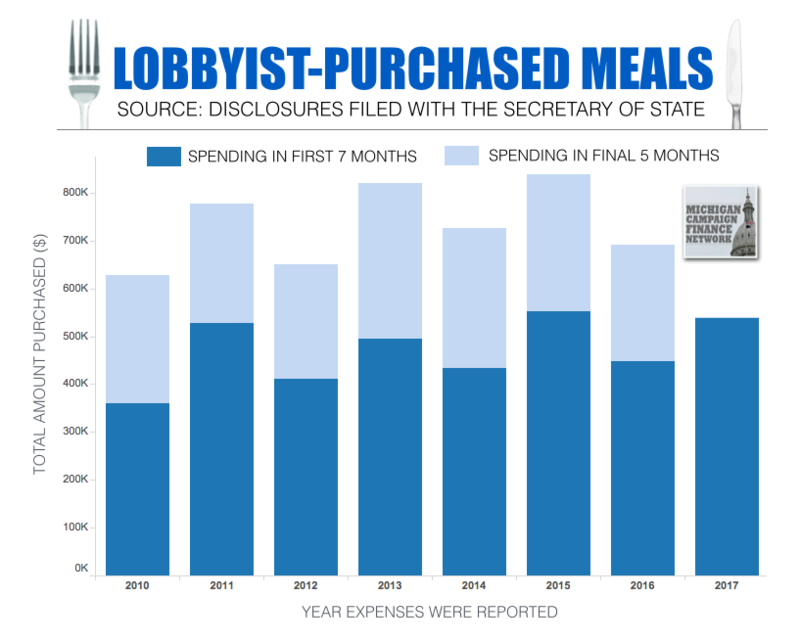 FILE Which Officeholders Received The Most Lobbyist-Funded Meals Over First 7 Months Of 2017?